I was able to take this photo on one of the final nights for the Tower of Terror in California Adventure before its permanent closure. At the time I couldn’t quite put my finger on what was different, but after I started doing digital work on the photo I realized that the owl sculpture that had been the centerpiece of the room was already gone. Looks like I’ll have to head to Disney World if I ever want a photo of that creepy owl. 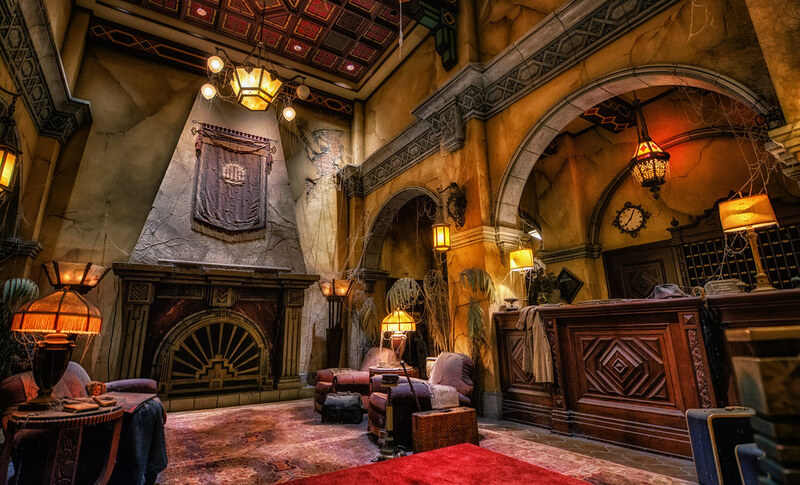 Now here’s hoping that the queue for Guardians of the Galaxy: Mission Breakout will be half as classy as this one was! This entry was posted in Hollywood Land and tagged Hollywood, tower of terror, twilight zone. Bookmark the permalink.